Catamarans are lightweight craft which can carry a larger sail area and therefore can sail faster than monohtilled boats, because of the greater stability given by the twin-hulled design. Apart from the design features made necessary by the twin hulls, such as the central bridge deck trampoline, twin rudders and a forestay bridle (see opposite), catamarans have several features not found on other high performance boats to help you cope with the higher speeds. The sails are particularly flat and the mainsail has full-length battens to keep il tensioned. 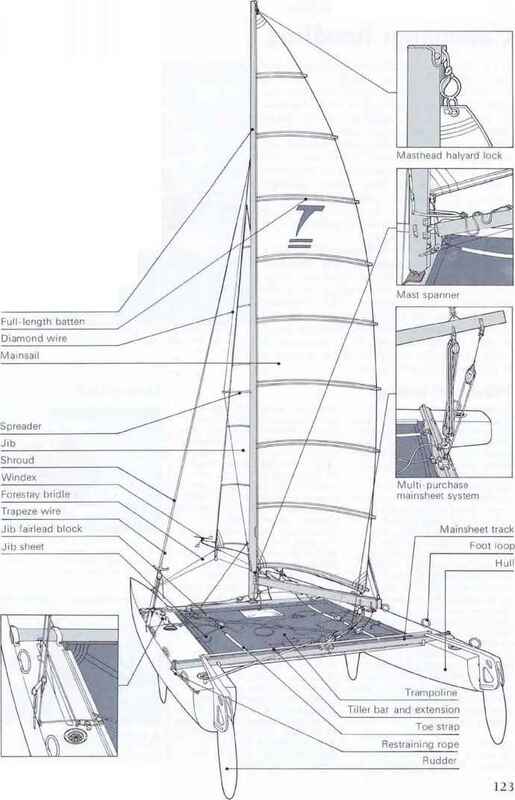 Both the mainsail and jib are controlled by complex (multi-purchase) pulley systems for easier handling. A rotating mast is also litted which allows a more effective air flow. Some different types of catamarans are: the Hobie, far right, which is a two-man catamaran, the Unicorn (center right) which is a single-bander, and the Dart, right, which is sailed single-handed without the jib and as a two man boat with the jib. There are some variations in all the designs: the Hobie. for example, has a raised trampoline and the Spark has no boom (detail below). stable than monohulls. they are easier to jibe. However, they can and will capsize, sometimes even stern over bow (known as "pitchpoling"), if the bows dig into the water when the boat is travelling at high speed. An important point for someone new to catamaran handling to bear in mind is that because the fastest point of sailing is a beam reach, the boat must make maximum use of the speed gained on this course wherever possible. For example, it is most efficient to sail slightly off a close-hauled course or a dead run and to tack towards your objective, taking advantage of the boat's natural speed. Before going out in a catamaran, remember that it gives little protection to the crew. Because of the high speed at which it can travel, spray is thrown up with great force, so wearing efficient waterproof clothing is very important, especially in bad weather. On the Spark, a small, lightweight catamaran, the mainsail has no boom. On the Hobie. the trampoline is stretched on beams raised above the hulls. The Tornado is an Olympic class two-man catamaran with a trapeze. 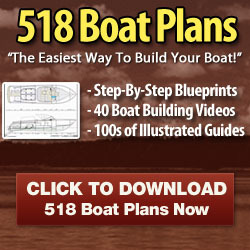 Its slim fiberglass hulls are joined by two aluminum beams. Kach has a center-board. A trampoline, made of strong nylon mesh, is stretched between the beams and hulls. A special mast spanner from the mast to the boom allows the mast to rotate. The mainsail is held locked into position by the masthead halyard lock. The sails are controlled by multi purchase sheeting systems. Foot loops and a restraining rope, which is hooked onto the trapeze harness, keep the crew in position when trapezing behind the helmsman. Which catamaran has no boom?